Jesse S. Fulton was born in Ohio, and was raised in South Florida. He attended the University of Florida where he received his Bachelor of Science in Business Administration degree, with a major in Finance, graduating with honors in 2010. Jesse then attended Stetson University College of Law, where he obtained his Juris Doctorate and a Master’s Degree in Business Administration. 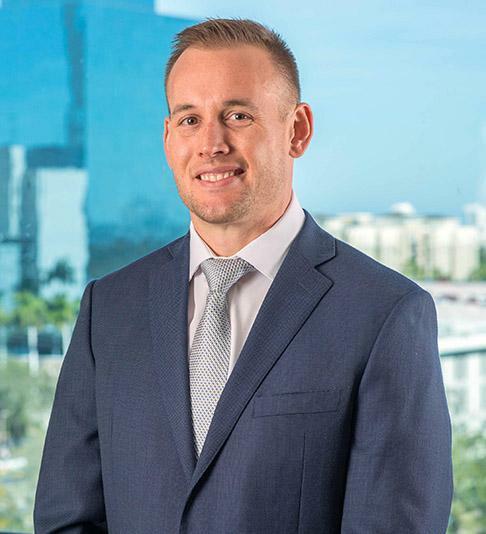 Jesse joined the firm in August of 2014 and works in a variety of areas including wrongful death, personal injury, business torts, environmental issues and multi-district litigation. Jesse concentrates his practice in complex business litigation matters, including private RICO causes of action, anti-money laundering, and anti-corruption. Jesse also provides consulting services for technology businesses and start-ups, including distributed ledger-based technologies, virtual currencies, smart contracts, and regulatory compliance. Over the last 4 years, Jesse has represented approximately 500 claimants against BP related to the 2010 Deepwater Horizon Oil Spill, securing settlements related to economic losses incurred as a result of the spill. Also during this time, Jesse has participated and successfully litigated a wide spectrum of cases, which has allowed him to develop and hone his trial skill set. Jesse has been published in the Daily Business Review multiple times, and has lectured on the impact of Blockchain and Cryptocurrencies in Real Estate. Jesse is a member of the Florida Bar and is admitted to practice in all Florida State Courts. He is also an active member of the Florida Justice Association, Broward County Bar Association and Broward County Trial Lawyers Association. When Jesse is not working, he is an avid traveler, having visited countries in Europe, Central America, and Southeast Asia. He truly enjoys being immersed in and learning about different cultures. Jesse is also a fitness enthusiast, and loves all types of outdoor activities and sports. He also is a member of the Ghost Light Society.